Let’s start with one of our favorites – Grit Coffee. 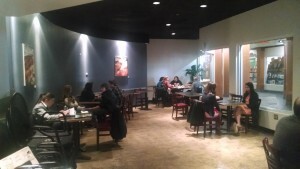 Formerly Cafe Cubano, Grit is locate on the Downtown Mall, in York Place. On sunny days, they have seating out on the pedestrian mall, or you can sit in the two inside sections. Cafe Cubano had a strong commitment to using local foods, and Grit seems to be carrying on this commitment. Their breakfasts include standard American fare – French toast, omelets (hmm, both of which are actually French, no? ), with several Cuban-South American choices (they were Cafe Cubano, after all). My current favorite breakfast is their Huevos Buenos – eggs and salsa with ham and potatoes. Flame generally puts her breakfast together from side dishes (she doesn’t eat wheat or dairy or sugar or…), scrambled eggs, vegetables and one of their salsas (fresca or tomatilla). Lunch is mainly sandwiches. They offer a number of breads (no gluten-free option yet), or Flame orders the “sandwich” without bread and gets extra lettuce. If you don’t drink milk, Grit makes its own almond milk, sweetened with dates. Flame’s drink of choice is an almond milk latte. Soy is, of course, available too. The staff are wonderful – friendly and helpful. They will often go out of their way to take care of customers. Grit stops serving food at 2pm, which has caught me several times (I’m a late lunch sort), but serves drinks until 5. Previous PostTravels with Flame and RavenNext PostWhere Is Thy Sting?